Kobori Manufacturing Company, Ltd. is a Japanese lens manufacturer. The company was founded on 1 April, 1925 to manufacture watch components. They expanded into aeronautical instruments for the military and later began to focus on optical equipment and camera lenses. The company reorganized as a corporation on 15 December, 1953. At a later date, Kobori became a subsidiary of Marukei Sangyo Co., Ltd.. Most of the lenses are made for rebranding by other companies. 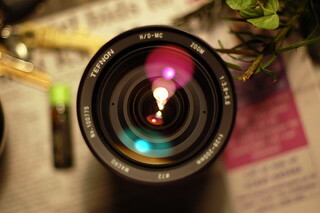 Well-known company brands that have appeared on Kobori lenses include Minolta, Sony, Nikon, and Vivitar. In 1986, Kobori was one of four companies to obtain a license to manufacture Maxxum lenses for Minolta (the other companies were Cosina, Tamron, and Tokina) The company also sells lenses under its own brand name Koboron and in the past used the names Tefnon, Teknon, and Technon, however the latter three trademarks have expired and are no longer in use. ↑ Trademark registrations for Marukei Sangyo Co. Ltd. This page was last edited on 20 March 2019, at 11:09.